Step 1. Place beans and chilli in a bowl. Step 2. Warm in microwave on high for 30 seconds. Step 3. Whisk mixture together until well combined. Step 4. Serve with a large bowl of good quality corn chips. This is one of those dips that grows on you. After a few bites you can't stop yourself. If you want to up the flavour content you can add some Tabasco to make it spicier. You can also add some cumin or even some taco seasoning at the beginning to give it a flavour punch. We used natural corn chips which married well with the re-fried beans. If you used flavoured corn chips it would over-power the flavour of the dip. You could also serve Guacamole dip on the platter alongside this dip. They make a great combination. 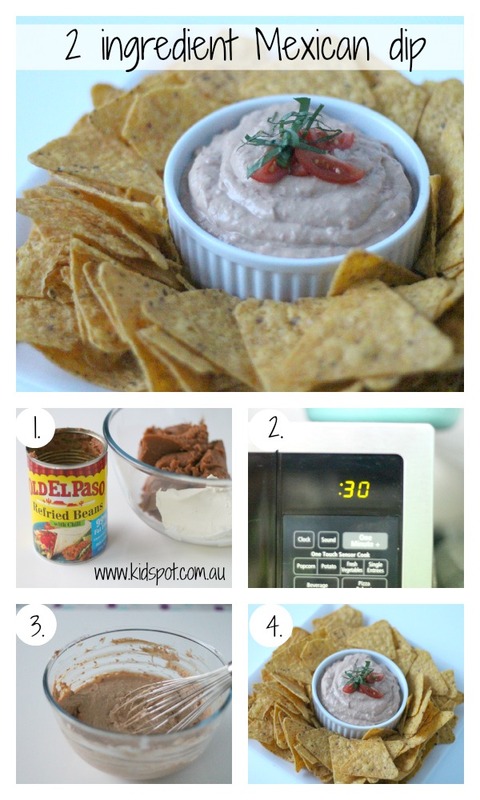 If you want another super-quick dip then try this Quick sour cream dip. This 3 ingredient beetroot dip is bursting with fresh flavours and the colour is great too. For a trip back to the 70's you can whip up this French onion dip and crudites and the whole family will dig in. If you like a warm dip to share with a crowd then try this Spinach cobb dip. It is a real crowd pleaser. This Roasted eggplant dip has a deep smokey flavour that goes perfectly with all Middle Eastern foods. If you think spice is nice then this creamy Pumpkin chilli dip is a yummy treat. Just grab some pita bread and spread it on.